What are Complete Streets? Streets designed to enable safe access for all users. Who should attend this workshop? Local elected and appointed officials, planning and zoning practitioners, health officials, walking and biking enthusiasts, local leaders, and interested community members. 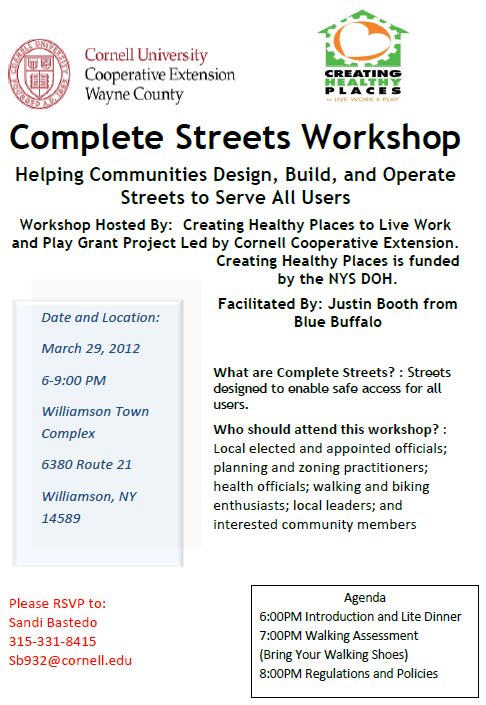 Workshop Hosted by: Creating Healthy Places to Live Work and Play grant project led by Cornell Cooperative Extension. Creating Healthy Places is funded by the NYS DOH. 0 Comments to "Complete Streets Workshop"